A funding platform like Kickstarter, ZenFunder provides a quicker way to translate a good idea into reality. Built specifically to meet the needs of local government and education, it combines "crowdfunding" with participatory budgeting. ZenFunder makes sure requirements, budgets, and assessments are completed. Organizations that join ZenFunder can use either the free or premium versions. For an annual fee, the premium version provides more robust tools for managing funds. ZenFunder offers an alternative and innovative method for meeting a community's needs. When he first learned about ZenFunder, San José City council member Pete Constant immediately recognized its potential for aiding the city. 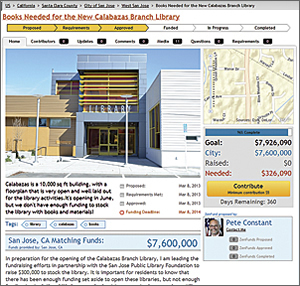 The first project was raising additional funds to complete the Calabazas Library, which has been closed for remodeling for about two years. Although $7.6 million had been spent on the structure, no funds were set aside for stocking the library shelves. 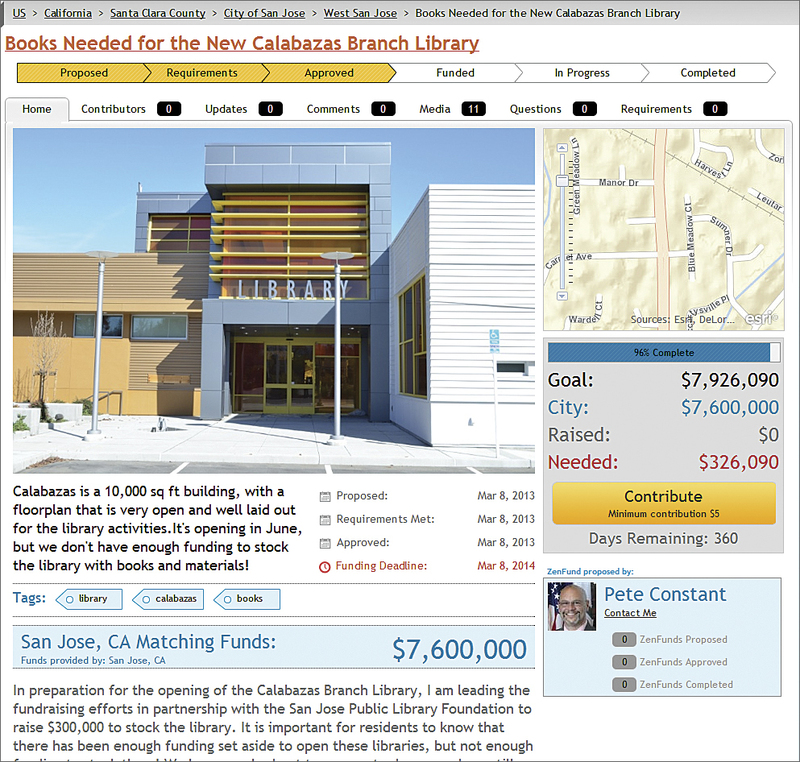 This project would raise a little over $325,000 to improve the library's collection. Two other projects, both for pedestrian crosswalk flashing beacons to improve safety at busy crosswalks, have also been proposed. "ZenFunder is based on the premise that if everyone gives a few dollars, we can fund important hyperlocal projects that directly benefit our community," said Constant. "This is really democracy in action."